Wicked GT 2015 officially in the books! Winners announced! The first ever Wicked GT (@thewickedgt) has come and gone and this past weekend brought together 26 generals from as far west as Denver, Colorado and all the way up north to Illinois and then down south to Oklahoma City, Oklahoma! We had some great players, some excellent armies, and enough shenanigans to go around for the entire weekend! First and foremost, we’d like to give a HUGE shoutout to all of the players. Truly, without you, the players, the Wicked GT would never have happened and been the huge success that it was. The players always make these events awesome and, as a TO, getting to interact with new and old faces alike makes putting on something as special as a grand tournament definitely worthwhile. So a huge thank you to all of the players that dealt with my endless emails and updates, requests for new army lists, and making sure you were paid up and on time! Thank you guys so much! Secondly, I’d like to thank all of our sponsors – Hero Complex, Bits of War, Hobbytown USA, Cardboard Arcade, Dave Graffam Models, and Secret Weapon Miniatures. For everybody that attended, make sure to check in your Players Packet for all the information you need to get in touch with any of our sponsors. Much like the players, the GT would not be possible without the help from our great sponsors. We had donations from everybody that ranged from boxed sets and blisters to custom bases and miniatures that were used as prize support, and even the terrain that graced all of the tabletops that were up at the Wicked GT. For anybody that has an interest in this hobby, please make sure to visit each and every one of these sponsors because they make / sell some of the best accessories / gaming items you’ll ever need. Thank you to all of our sponsors! You helped make the Wicked GT a success! Thirdly, I’d like to thank some people in particular. Chris McArthur put together all of the awesome trophies that you can only find at the Wicked GT. In addition to having a unique gaming experience at the Wicked you also get one-of-a-kind trophies that you can’t find anywhere else. The trophies were fan favorites all weekend long so thanks to Chris for making it happen. Also, Brian Hunter (@bambamhunter) did all of the artwork that you seen at the GT this weekend and the images that grace this website. He’s a unique talent that helped to drive home the theme that we were wanting for the Wicked GT so thanks to him as well. And Alex Bade helped to actually get all/most of the items up to the venue this past weekend. This is referring to the keg, tables, etc and he even worked to put together the top 2 theme tables that included the custom tornado and yellow brick road! All of these guys combined helped to make the Wicked GT unique and their help definitely didn’t go unnoticed. Thanks to all of these guys! 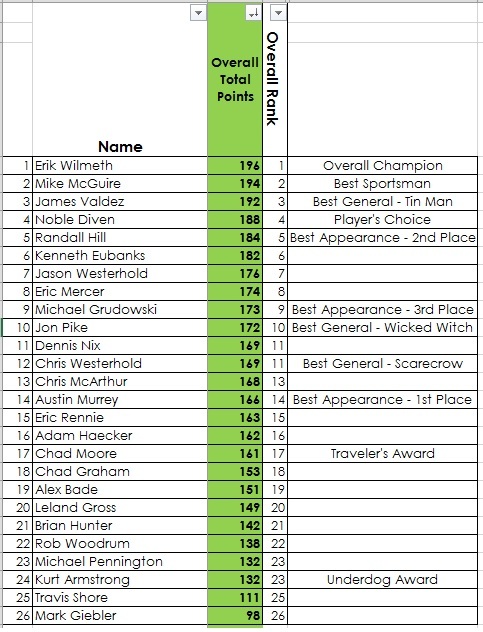 Now, it’s time to get down to the final standings… But before we do that let me make just a few more bullet points to let you know what’s coming. – Surveys! We are going to send out surveys to everybody that attended to get your feedback on the Wicked GT as a whole. Please let us know how we can improve. Remember, if you had a great time at the Wicked GT then please tell other people. If you didn’t, please tell us. There’s no way we can improve if we don’t know what went wrong. We are big boys and gladly accept criticism. It’s the only way we can improve your future Wicked GT gaming experience. Be expecting these surveys shortly! – Wicked GT 2016! We haven’t finalized a date yet but we know that the Wicked GT 2016 is already set for March 2016… that means we are already within 10 months from having the next one! We were able to switch spots with the Slobberknocker, which works out better for both parties. Once dates are set and we know what’s what, we’ll open registration right here on this website! Stay tuned! And now for the final standings! Make sure to follow the link below to find out where everybody ended up and also visit the Results page as well as the Golden Toto Painting Competition page to see how that turned out. Golden Toto Painting Competition Results! Traveler’s Award – Chad Moore / Droppin’ Deuces / Fort Collins, CO – 569 miles! Be sure to visit the other pages to check out all of the pictures that show some games in action as well as the lovely bartenders that we had, the venue after set up, and even some Friday night gaming that took place. Thank you again to everybody that participated as well as our sponsors! Next year is going to be even bigger and better! If you have any questions at all please don’t hesitate to ask! Thanks again for making the Wicked GT 2015 a huge success!!! This entry was posted in General Updates and tagged @thewickedgt, Bits of War, Cardboard Arcade, Dave Graffam Models, Golden Toto Painting Competition, Grand Tournament, Hero Complex, Hobbytown USA, Secret Weapon Miniatures, Warhammer Fantasy, Wicked GT. Wicked GT Countdown – Just 2 more days & The Wicked GT joins Twitter! Sponsor Spotlight : Bits of War & Summertime Wicked GT News!